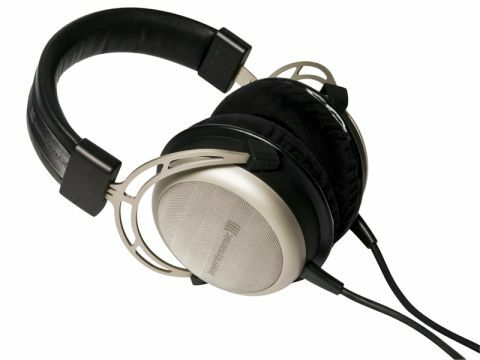 Beyerdynamic has decided to set high-strength magnets at the core of the design for its flagship headphone, the T1. Nestling inside its sculpted foam aluminium flight case, the T1 is a handsome beast, all svelte, business-like industrial design, which leaves a lot of other pricey cans looking almost crass by comparison. Behind the classy mesh grilles on the satin aluminium and plastic earcups are diaphragms made of two-ply foil, which features low moving mass and good inherent self-damping. Fastened to the diaphragms are 600 ohm voice coils, again lightweight examples of the breed designed to optimise the T1's dynamic response. The drivers are fitted to the front of the earcups, angled back towards the ear. What Beyerdynamic has tried to achieve with these drivers is a similar trick to that managed by the classic F-15 fighter plane – very high power to weight ratio. The F-15's party piece is accelerating through the sound barrier whilst climbing vertically – the T1's skill is a very low-mass diaphragm in a very dense magnetic field of 1.2 Tesla. The result should be a very crisp, fast and transparent sound with low distortion (quoted at 0.05 per cent). To hold the T1 is to want a pair: it's that simple, as these really are very well-built 'phones. The laser-cut headband with its firm, but forgiving padding has minimalist good looks in abundance. The three-metre cable, a double-sided, six-core balanced type terminated in a gold-plated Neutrik 6.35mm jack, feels reassuringly proofed against unintended tugs. To cap it all, despite not being a featherweight item, the T1 remained comfortable to wear for hours on end, though comfort varies, so has to be checked on a listener-by-listener basis. For the price they command, I have to say I was already tempted to shell out on a pair, in the hope they'd sound as good as they look. In a nutshell, the T1's sound mimicked its appearance: clean, crisp and persuasive. Hooked up first to Beyer's own A1 headphone amp, midrange and treble were detailed and revealing without being in any way fatiguing. Bass had an attractive weight to it, especially on electronic music like The Knife's Silent Shout album. On the other hand, imaging and soundstaging were both a little restricted, indicating the need to put some more hours on the drivers. Over the course of three or four days with various CDs on repeat, the extra hours paid off in a better controlled bottom end, more finely detailed treble and midrange, and superior overall transparency. Now the T1 had a more fluid, natural sound, which was musical in a way which kept me listening. In one respect, the T1's character (and it does have a definite character) reminded me of Lowther's DX5 driver. Sharing high magnetic flux density and neodymium magnets, the two have a very crisp, detailed sound with an emphasis on the upper midrange, which brings detail forward. While the T1 could never be described as slow, its dynamic agility is less obvious, the boost to the upper midrange balanced against a lift in the lower bass to give subjectively a slightly slower sound. The T1 may not be a strictly accurate headphone, but it pays its way sonically. Those high-sensitivity drivers uncover a lot of detail and the lift in the midrange gives them a real sense of presence. The sum of these parts is a welcome new arrival among the ranks of high-end headphones, one which should definitely be auditioned alongside Sennheiser's acclaimed HD800.